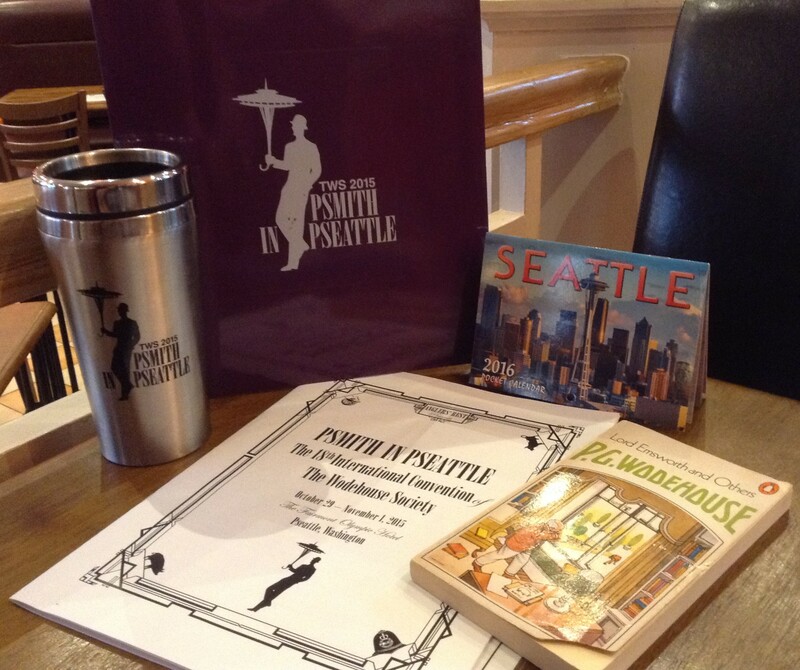 Last week I attended an excellent binge at The Wodehouse Society’s (TWS) 18th convention, Psmith in Pseattle. It was my first TWS convention, and even more psensational than anticipated. So, climb upon my knee, Sonny Boy, and I’ll tell you about it. As a TWS first timer, I entered the lobby of the impressive Fairmont Olympic Hotel under a cloud –not one of Seattle’s famous v-shaped depressions, but a personal one. Having lived almost exclusively behind a keyboard for the last few years, my people skills are not what they once were. Nor are my trousers, which are let out far more often than I am. So it’s fair to say I was not at my confident best, and beginning to wish I’d stayed under my little rock in Somerset UK. Added to this, I had recklessly agreed to appear as a speaker and was feeling a strong affinity with Bertie Wooster ahead of his infamous talk at Miss Tomlinson’s school for girls. “Girls,” said Miss Tomlinson, “some of you have already met Mr. Wooster — Mr. Bertram Wooster, and you all, I hope, know him by reputation.” Here, I regret to say, Mr. Wooster gave a hideous, gurgling laugh and, catching Miss Tomlinson’s eye, turned bright scarlet. All that began to change, very quickly. As I traipsed across the lobby, I spied the familiar, well-groomed head of TWS president Karen Shotting rising on the escalator. Recognising her from her photograph, and forgetting that we had never met, I buzzed over to say ‘What Ho’ like a long lost friend. A short while later, I was on back-slapping terms with a substantial gang of Wodehouse experts and enthusiasts, including Tom Smith, Barbara (the dream rabbit) Combs, Elliot Milstein, Bob Raines (soon to be TWS president), Ken Clevenger, and Tony and Elaine Ring. The name Tony Ring is familiar to most Wodehouse enthusiasts and I’d been daunted by the prospect of meeting him, but his effervescent personality put me immediately at ease, and the sparkle in his eye told me that this shindig was going to be fun. The following morning, I encountered Elin Woodger Murphy (Wooster Sauce editor and all round good egg) sploshing about in the hotel pool. Having already provided me with guidance and support from afar, Elin took me under her wing and, with the fabulous Jean Tilson, we forked our way through some very decent breakfasts at Seattle’s Pike Place market. Later in the lobby of the Fairmont Olympic, I got to meet online friends for the first time — like Vikas Sonak, and David and Katy McGrann — and make new ones, like Katherine Jordan, Eileen Jones and Ninad Wagle (Alpine Joe). From my strategic position by the bar, I was also well-placed to spot debonair newcomers sporting chrysanthemums their in buttonholes [enter John Dawson]. The formalities began on Friday evening with soprano Maria Jette and pianist Dan Chouinard, who performed songs from Wodehouse’s Broadway career and songs mentioned in his work, like My Hero and The Yeoman’s Wedding Song. A minion came on the stage carrying a table. On this table he placed a framed photograph, and I knew that we were for it. Show Bertram Wooster a table and a framed photograph, and you don’t have to tell him what the upshot is going to be. Muriel Kegley-Bassington stood revealed as a ‘My Hero’ from The Chocolate Soldier addict. Maria sparkles on the stage like a Wodehouse heroine leapt from the page, and it was a great privilege to hear these songs performed by musicians of such calibre. 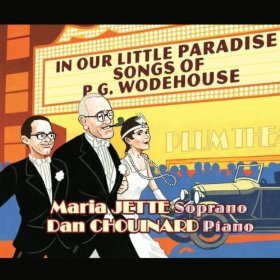 If you missed out, Maria and Dan’s two CDs of Wodehouse music are available online. Mixing it with the professionals, an enthusiastic Tom Smith (one of our Pseattle hosts) and his associate ‘Percy Pilbeam’ treated us to a rendition of Sonny Boy. No CD recording of this memorable performance has yet been released. The joy continued on Saturday with riveting talks. If you missed them, they’ll be published in forthcoming editions of Plum Lines, quarterly journal of The Wodehouse Society (US) , not to be confused with Wooster Sauce, quarterly journal of The P G Wodehouse Society (UK) — if you join both societies you get eight lovely journals in the post every year. Each talk was worthy of further discussion, and I took plenty of notes, but for now you’ll have to be content with a summary. I was riveted from the moment Elliot Milstein drew his first breath, on the subject of Wodehouse’s opening lines, and listening to Ken Clevenger let himself go on the subject of fish was a long-awaited pleasure. During the luncheon break, I made a Skype call to my family in England to gloat that I’d been educated on the difference between orphreys and chasubles by William Scrivener, who was once a pale young curate. Peter Nieuwenhuizen’s talk on Wodehouse in the comics covered new ground (for me at least). Graphic novels are incredibly popular with young readers and the potential for introducing them to Wodehouse in this way is very exciting. Tad Boehmer’s talk on researching Wodehouse took us into the world of special collection libraries (I wanted more!) and Elin Woodger’s topic ‘P.G. Wodehouse, Feminist’ was a topic close to my heart (as readers of Plumtopia will know). For anyone still in doubt about Wodehouse’s appeal to women, Elin confirmed that more women had registered for the convention than men. John Dawson spoke about the exciting Globe Reclamation Project , an international gang of Wodehouse lovers (Dawson, Ananth Kaitharam, Neil Midkiff, Ian Michaud, Arthur Robinson, Raja Srinivasan and Karen Shotting) who have spent the last two years researching, transcribing and evaluating material written during Wodehouse’s time at the Globe newspaper (1901-1909? ), aided and abetted by Wodehouse experts Norman Murphy and Tony Ring. John spoke passionately about his personal quest to find everything Wodehouse wrote, and the hard working collaboration that has provided so much ‘new’ material for all Wodehouse readers to enjoy. The product of their labours is available to read — in two handsomely bound volumes: P.G. Wodehouse in the Globe Newspaper Volumes 1 & 2 . 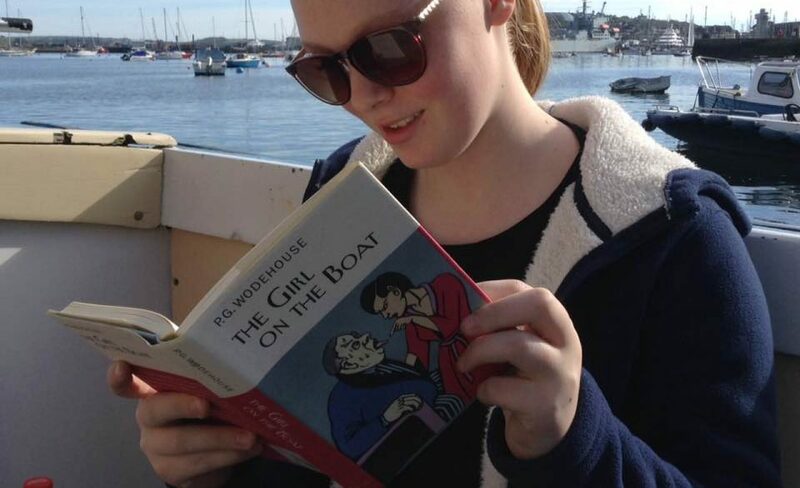 This is a non-profit undertaking, with funds raised used for ongoing research (any surplus will be spent making Wodehouse books available in school libraries). A discount is available to Wodehouse Society members. In my talk on the modern Wodehouse reader, I commented that many of us read Wodehouse to escape the irksome captivity of modern life, just as Evelyn Waugh predicted. Listening to Robert McCrum, it became clear to me that Wodehouse needed the world he created as much as we do. It was his ‘Plumtopia’. I don’t think I’ve ever felt closer to Wodehouse than I did at that moment. McCrum has shared his own impressions of Pseattle in this little piece for The Guardian: Americans celebrate PG Wodehouse in Seattle . A groan and a weird phosphorescent gleam at the foot of the bed told that the spectre had arrived, right on the scheduled time as usual. I took no notice. I wished to make the ghost speak first. A ghost hates to have to begin a conversation. “You might speak to a chap,” said a plaintive voice, at last. MR. PUNCH’S SPECTRAL ANALYSES II.— The Ghost with Social Tastes. A handsomely printed set of these stories was provided to conference goers, but if you missed out you can read them online at Madame Eulalie’s Rare Plums . 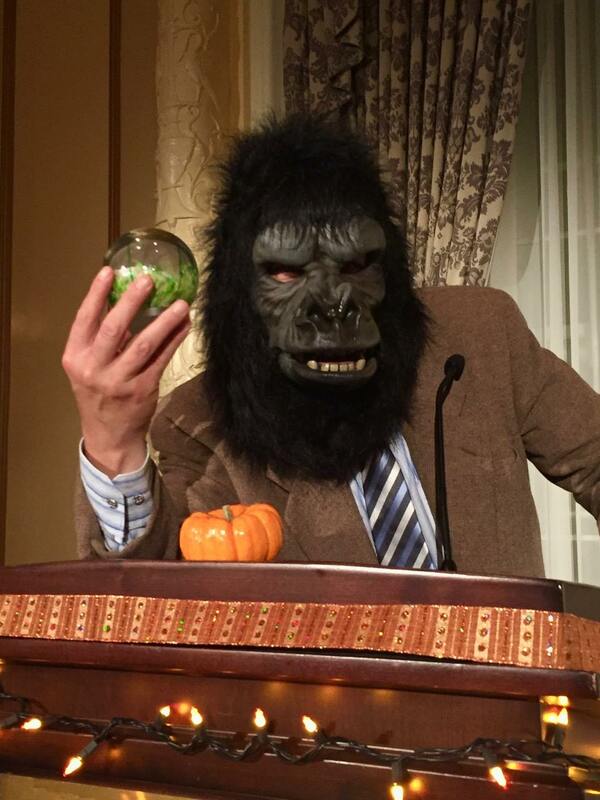 There is still much to be said– about the masked ball, the costumes, the auction, and NEWTS skit — but I have other things to do, and presumably you do too. The one thing I must mention is the rummage sale. Just imagine for a moment that you are in a shop devoted to Wodehouse. There are Wodehouse books, and books about Wodehouse. You can also pick up sheet music, costumes, cow creamers, pictures, bookmarks, badges, bags and all manner of merchandise. No shop of this kind exists, but for two days in October the TWS rummage sale comes close to this Plumtopian ideal. Michael Sheldon as Blister Lister (Full Moon) courtesy of budding wildlife photographer, Ellie Sheldon. Added to these pleasures, I continued to make new friends, too many to list, but sitting with Donna Myers for the talks, and between Anita Avery and Tim Richards at dinner were highlights. There was an awkward moment when I met long-time Facebook friend Michael Sheldon in person — as he recognised me, but I couldn’t place him because he looked nothing like his Facebook photo (for all the wrong reasons). He won the ‘Scary Enough to Put a Golfer Off His Stroke’ award for his impersonation of Bill Lister (from Full Moon). The next convention will be in Washington DC — Capital! Capital! — in October 2017. Dates will be confirmed shortly. I see you received a well earned mention in Mr McCrum’s article. Yes… I ought to have mentioned when sharing that it was a shameless act of self-promotion. McCrum was a fascinating chap to spend time with. I’ve seen a speech of his on the internet which I very much enjoyed, I’ve also read a few of his articles on the Guardian website. However I must confess, I haven’t read his biography yet. Get to it, old bean. I’d be interested to know what you make of it. I enjoyed meeting you, and am happy that American bathroom scales are more forgiving when it comes to weighing luggage. Hi Liz. That was very funny! It was great meeting you too, but it was far too brief. Thanks Honoria – a wonderful summary of the weekend, and saves me having to try to do it myself (not nearly so well). Will share. Thanks so much Maire. After posting it, I realise I had left off a paragraph, lamenting how soon it was all over, with so many people still to meet. Two years is such a long time to wait for another. Great to read this…you have made it feel as if one was physically there, with the aroma of freshly baked Plum Pie in the air. It would have been great if you had been, Ashok. I know you would have loved it. Thank you. Hope a reblog would not be taken amiss? Dear old bean, what a topping time you had in Pseattle, although, having been outed by Mr McCrum, you can no longer be simply Honoria. I’ve always thought you were far too nice to be that character-moulding person anyway. I wonder, given your posterior concerns, whether the many friendly faces you met were shining like the seat of a busman’s trousers. Toodle-pip. Quite so, Noel. Quite so. I had tried to work in a gag about the armchairs at the Fairmont Olympic being fashionably tight about the hips, but they were nothing of the kind (and very comfortable too). Frightfully spiffing piece, old girl! Don’t know how you do it, but it’s like hitting something on the something. And what an Honoria to be mentioned in the article. Deserved or not, it’s there for everyone to see. Thanks for reviving my memories of Pseattle so vividly! My pleasure Vikas. It was great to meet you. It felt like we were old friends. Superb as ever, Honoria, and we were so glad you made the trip and speech for us. Oh, Ken — it was an honour and a privilege. And I loved every minute of it. What a perfect précis of that weekend of Sweetness and Light! Until now, my favorite line (about myself) had been, if memory serves, “If variety is the spice of life, Maria Jette is a spice rack.” I have enjoyed that description, but definitely prefer yours, my dear old chronicless deluxe! I’m mystified by my previous obliviousness in re your blog, but shall now sign on with gusto. It was a pleasure to meet you, and a ridiculously brief time of it, but the golden Future awaits, and I know we shall meet again, soonish. What ho, Maria. Our time together was far too brief. I loved your sparkle, on stage and off. If you missed being with Psmith in Pseattle, do not worry. Here is a quick recap of the revelries which ensued. Honoria Glossop recounts her escapade with some juicy details here. Her speech on the psychology of the Plum reader, ostensibly delivered after she had gulped down a jugful of the right stuff, was received with much enthusiasm. Soak in the sunny details!